WILLIAM HENRY HARRISON. Newspaper. National Intelligencer, March 6, 1841. Washington, D.C.: Gales & Seaton. 4 pp., 18 x 23¼ in. 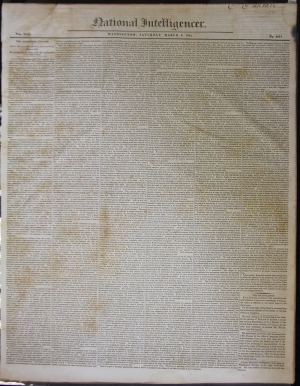 This issue also includes Congressional resolutions regarding a public printer (p2/c5-6); foreign news from India and Macao (p3/c2); news of negotiations with Native Americans in Florida (p3/c5); a complete list of laws passed by the second session of the 26th Congress (p4/c1); the address of Vice President John Tyler, after taking the oath of office (p4/c2); and extensive coverage of the inaugural parade (Harrison was “mounted on a white charger”), inaugural ceremonies, and festivities in Washington (p4/c3-5). William Henry Harrison (1773-1841) was born in Virginia into a prominent planter family and studied at Hampden-Sydney College and the University of Pennsylvania. He joined the army in 1791 and participated in the Northwest Indian War, including the decisive victory at the Battle of Fallen Timbers in 1794 and the Treaty of Greenville in 1795, which Harrison signed as a witness. He married Anna Tuthill in 1795, and they had ten children. In 1798, Harrison resigned the military and became secretary of the Northwest Territory. He later served in the U.S House of Representative from the Northwest Territory (1799-1800) and as governor of the Indiana Territory (1801-1812). In 1811, he defeated Shawnee leader Tecumseh at the Battle of Tippecanoe, for which Harrison was praised as a national hero. During the War of 1812, Harrison commanded the Army of the Northwest and defeated the British and their Indian allies at the Battle of the Thames in 1813. After disagreements with the Secretary of War, Harrison resigned in 1814. He represented Ohio in the US House of Representatives (1816-1819) and in the US Senate (1825-1828). After running as a regional Whig candidate for the presidency in 1836, Harrison won the 1840 election over incumbent Martin Van Buren. On March 4, 1841, a cold, wet day, Harrison wore no hat or overcoat, rode on horseback to his inauguration, and delivered the longest inaugural speech of any American president. He became ill three weeks later and died of pneumonia on April 4, having been president for 31 days. He was the last United States president born as a British subject, and the first to die in office. National Intelligencer (1800-1870) was a prominent newspaper published in Washington, DC. In 1800, Thomas Jefferson, then vice president and a candidate for the presidency, persuaded Samuel Harrison Smith, the publisher of a Philadelphia newspaper, to open a newspaper in Washington, the new capital. Smith began publishing the National Intelligencer, & Washington Advertiser three times a week on October 31, 1800. In 1809, Joseph Gales (1786-1860) became a partner and took over as sole proprietor a year later. From 1812, Gales and his brother-in-law William Winston Seaton (1785-1866) were the newspaper’s publishers for nearly fifty years. From 1813 to 1867, it was published daily as the Daily National Intelligencer and was the dominant newspaper of the capital. Supporters of the administrations of Thomas Jefferson, James Madison, and James Monroe, Gales and Seaton were the official printers of Congress from 1819 to 1829. From the 1830s to the 1850s, the National Intelligencer was one of the nation’s leading Whig newspapers, with conservative, unionist principles.